Artistic considerations aside, it’s an interesting device from a technical point of view. [Bryan] built it from a 7.4-inch e-ink display from Pervasive Displays. The controller is connected to a Raspberry Pi Zero, which is running a Python script to convert a frame of the movie file into a dithered file, then send it to the display. Because the Pi Zero isn’t a very fast computer, this takes some time, and thus the slow speed of the VSMP. Originally, [Bryan] had set it up to run as fast as the system could manage, which was about 25 seconds per frame, or about 2 frames per minute. He decided to slow it down a bit further to the more attractive multiple of 24 frames per hour to contrast with the 24 frames per second of the original movie. He did this by using a CRON job that kicks of the conversion script once every 2.5 minutes and increments the frame counter. All of this is topped off with a nice 3D-printed case that has a lovely interference pattern to make a rather neat and intriguing project. Perhaps the best part of this is see a time-lapse of the VSMP — life moves quickly around it while 2001: A Space Odyssey plays at normal speed. The folks at Physalia studio were asked by a company called IdN to produce a little bit of video with a logo. After tossing a few ideas around, they hit upon the concept of projecting the IdN logo inside a falling water droplet. CGI would never get this idea right, so the finished product is the result of stop-motion animation created inside several thousand falling drops of water. Taking a picture of a falling water droplet was relatively easy; a small drip, a laser pointer and photodiode, and a flash trigger were all that was needed to freeze a drop of water in time. The impressive part of the build is a motion control system for the camera. This system moves the camera along the vertical axis very slowly, capturing one water droplet at a time. Behind the droplet is a an animation that’s seemingly inspired by a Rorschach test, ending on the IdN logo. The frames for these animations were printed out and placed inside the test chamber/studio upside down to account for the optical effects of a sphere of water. The end result is a product of over 20,000 pictures taken, all edited down into a single 30-second shot. An amazing amount of work for such a short video but as you can see in the videos below, it’s well worth the effort. A little bit of technology goes a long way when it comes to stop motion animation. In this case it’s a trio of simple camera dollies built during production of a short film called The Maker. A Dolly is a method of mounting the camera so that it can be moved smoothly during a shot. Of course with stop motion the movement actually happens between the shots so it’s even more important that the camera be moved accurately. The video after the break shows off how they added CNC control for the camera. The first dolly was built from a pair of PVC pipes with a sled that moves along them. A motor moves a loop of 35mm film which is attached to the dolly. This is a great choice of materials since it doesn’t stretch and it’s free (one of the filmmakers is a projectionist). 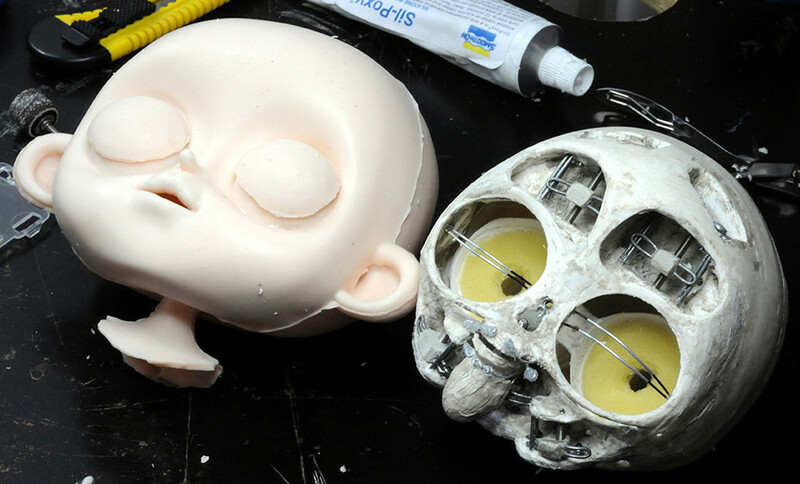 The next dolly is made from a flatbed scanner, and the final offering is seen above. Built from a bicycle wheel it provides a stationary platform above the hub for the models, while the camera rotates on an arm attached to the wheel. You can watch the complete film here. 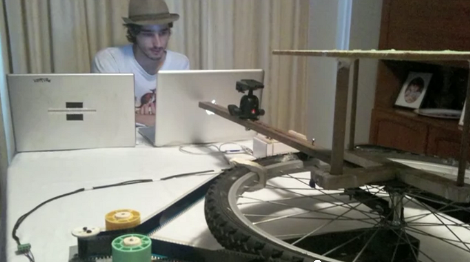 If you’re looking for more inspiration check out this dual-axis PVC dolly project.